Solid rubber ankle cuffs with D-ring. Closing on one buckle. 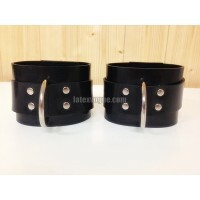 Height of cuffs 6 cm.Price per pair.Spe.. Solid rubber wrist and ankle cuffs with D-rings. Closing on one buckle. Height of cuffs 6 cm.Price p.. Heavy rubber wide ankle cuffs with D-ring. Closing on two buckles. Height of cuffs 10 cm.Price per p.. Solid rubber wrist cuffs with D-ring. Closing on one buckle. 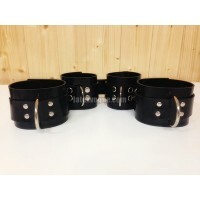 Height of cuffs 6 cm.Price per pair.Spe.. Solid black-red rubber wrist cuffs. With D ring and spines (according to stocks). Closin.. Solid rubber wristbands with D-ring with lacing.Price per pair. Price only for wristbands.Specificat.. Solid rubber fetish brace with three buckles for tightening. Length of wristbands about 23 cm.Price ..